We went hands-on with the Surface Laptop last week and plan to test it in advance of its June launch. Until then, if you're trying to decide between the Surface Pro 4's promise of a tablet that can be a full-fledged computer, and the Surface Laptop's full-fledged computer that's nearly as light (and a lot newer), let’s dig into the specs. Neither the Surface Pro 4 nor the Surface Laptop is especially cheap (see prices above). Selecting the right Surface Laptop comes with a caveat: It's aimed at education, where you’ll be subject to the whims of professors who dictate what software to buy. The entry-level models with 4GB of RAM may struggle if burdened with demanding applications. The models with 8GB of RAM or more will have better staying power. 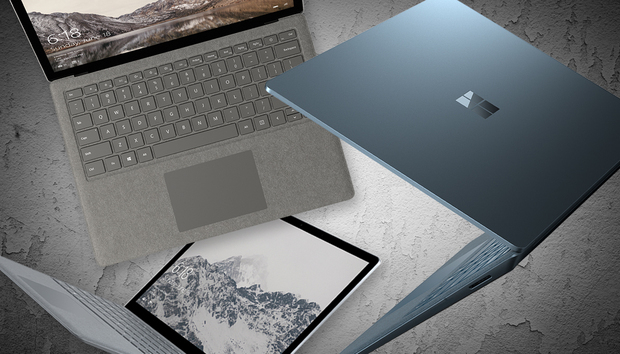 Unlike convertible laptops, though, the Surface Laptop lacks a 360-degree hinge. While Microsoft made the hinge an important design element of the chunkier Surface Book, the Laptop’s hinge is virtually invisible, and apparent only if you open the device and squint. The most confusing aspect of the Surface Laptop for most people is its operating system. While the Surface Pro 4 ships with Windows 10 Pro, the Surface Laptop is the first Microsoft device to come with Windows 10 S, a version of Windows 10 designed for educational institutions. To ensure greater manageability for school IT administrators, Windows 10 S machine can run only apps—both UWP and Win32—that are sold via the Windows Store. You're also restricted to Bing for search, and Edge for web-browsing. We didn’t have a chance to nail down the Surface Laptop's exact CPU during our brief hands-on time. We do know, though, that the Laptop uses a more modern 7th-generation (Kaby Lake) Intel Core chip, versus the 6th-generation (Skylake) chip found inside the Surface Pro 4. Based on our tests it’s a small advantage—but still a plus. Like the CPU, the Surface Laptop’s updated components simply give it an advantage here. I was honestly a little amazed that I could play some decently graphics-intensive games on the Surface Pro 4. The Surface Laptop’s HD 620 and HD Iris Plus 640 chips are the next iteration above the Intel HD 520 and Iris integrated graphics found in the Surface Pro 4. Though we can’t say exactly how fast they’ll be, you should see a marked advantage. Although I haven’t performed a touch-to-touch comparison, one of my strongest first impressions of the Surface Laptop was that its keyboard was a stiffened, rigid version of the Surface Pro 4’s Signature Type Cover: same touchpad, same keys, same Alcantara fabric. They’re both very good, though not quite as good as a traditional laptop's keyboard, or the Surface Book's. While the Surface Pro 4’s speakers are behind the tablet display (after frequent use, the right speaker on my unit is inoperable) the Surface Laptop puts its “omnisonic” speakers directly under the keyboard's Alcantara fabric. I haven’t tested the Laptop enough to know how well they sound, though removing them from behind the display created room for additional battery cells, a smart design decision. Microsoft's promise of 14.5 hours (in video playback) for the Surface Laptop’s battery life seems to far exceed the 9 hours of the Surface Pro 4. That longevity is thanks, in part, to the additional battery cells mounted behind the Surface Laptop’s display. If battery life is a factor in your decision—and it should be—than the Surface Laptop clearly wins. If the Surface Pro 4 ever receives its long-awaited refresh, deciding between the two Surfaces will require deeper thought. As it is, the Surface Pro 4 is still a quality machine, with few obvious flaws. Assuming you take advantage of the free upgrade to Windows 10 Pro, however, the Surface Laptop starts to look more appealing. A more modern processor and additional battery life start to justify the cost. Bang for buck isn't Microsoft's priority with these flagships, however, so value-seekers should cast a wider net. A comparison of the Surface Laptop against the Dell XPS 13 and HP Spectre x360 shows you some very competitive options.